Remember that homemade salted caramel sauce I shared with you earlier this month? Well I’ve found an absolutely amazing use for it. Can you guess what it is? The title kind of gives it away. My all-time favourite type of hot chocolate is peppermint hot chocolate. Make the hot chocolate up as you always do and stir a teeny tiny bit (about 1/8 of a teaspoon) of peppermint in at the end and it is absolutely divine. This salted caramel hot chocolate is so good that it almost knocked the peppermint hot chocolate off the number one spot…almost! 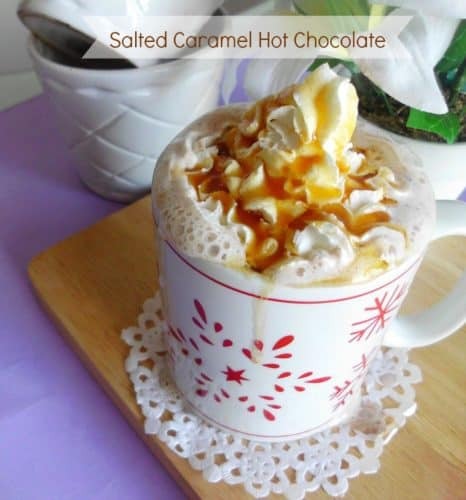 After drizzling it on top of ice cream, cupcakes, cookies and pretty much everything I could get my hand on, I figured this salted caramel hot chocolate would go wonderfully with hot chocolate and I was so right. You can choose to make this drink in one of two ways. You can make hot chocolate the way you usually do and stir in a tablespoon of salted caramel sauce at the end. Orrrrr you can follow my indulgent recipe for hot chocolate and stir the salted caramel sauce into that. Who knows? Maybe your hot chocolate recipe is a million times better than mine, but I still think you should try mine out. I made it this way once last year and I’ve been making it this way ever since! Adding the extra squares of chocolate really makes a difference. The whipped cream and salted caramel sauce topping are entirely optional, but oh-so recommended. What do you do with whipped cream on the top of drinks? Do you stir it in? Or do you do what I do and devour the cream spoonful by spoonful as fast as you can before it melts into the hot chocolate? Pour the milk into a mug and blast in the microwave for 1 minute. Stir in the sugar and hot chocolate powder into the mug. Drop in the chocolate squares and return to the microwave for 1 minute 30 seconds. Stir well to ensure the chocolate is melted and stir in the salted caramel sauce. Top with whipped cream and even more salted caramel sauce. Woah. Thank you for posting this! Salted Caramel Hot Chocolate from SBux is my favorite! This will be a great recipe to try on a more economical day!